This would push Ukraine in direct competition with Russia, which also supports those helicopters. 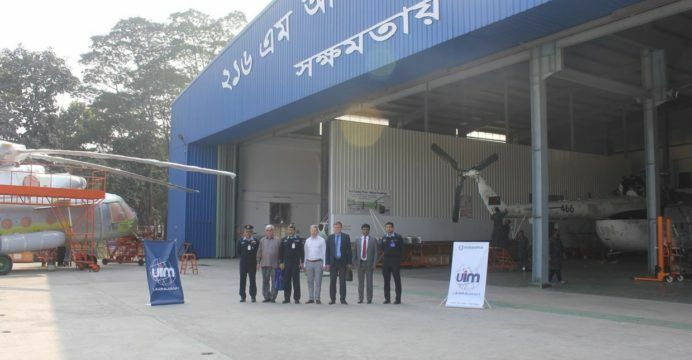 Ukraine's state-owned concern UkrOboronProm announced that one of its export companies, Ukrinmash, opened a service center for repairing Mil Mi-8 and Mi-17 transport helicopters in Bangladesh. In a press release dated January 31, 2018, UkrOboronProm states that the service center was formally opened on January 25. The facility was commissioned by the Bangladesh Air Force (BAF), the Quwa Defence News & Analysis Group reported. Previously, the BAF had its Mi-8/Mi-17 helicopters serviced by the Ukrainian maintenance, repair and overhaul (MRO) company Aviakon. In 2013-2014, Bangladeshi personnel had visited Aviakon to study the MRO process, specifically "repairing units and aggregates of the aviation equipment." UkrOboronProm states that Bangladesh received a full-fledged MRO facility, which will allow the BAF to undertake "routine repair, as well as deep refurbishment and modernization of fuselage of Mi-8/Mi-1 helicopters." However, Aviakon personnel will be "permanently" stationed at the Bangladesh site. According to Flight Global's 2017 World Air Forces record, the BAF operates 33 Mi-17 and Mi-171s along with four additional aircraft on order. UkrOboronProm is reportedly eager to expand its MRO activities in Bangladesh, with the BAF's transport and combat aircraft as potential commercial targets. Read alsoUkraine sets priorities in defense procurementTo support the Mi-8/17 MRO center's activities, new parts and engines will be sought. This would serve as a long-term market for Ukrainian companies involved the manufacturing of these inputs, such as Motor Sich, which manufactures the Klimov TV3-117 and VK2500-series turboshaft engines that power the Mil-8/17/171 helicopters. This would push Ukraine in direct competition with Russia, which also supports those helicopters. In fact, Ukrinmash CEO Serhiy Sliusarenko also accused its Russian competitors of foul-play in third-party bids that involve Soviet-era equipment, stating Russia "has been resorting to tactics of, for instance, bombarding potential customers with letters demanding to exclude Ukrainian enterprises from tenders." Read alsoRussia supplies arms to Kurds against Turkey – OSINT groupSliusarenko argued that Ukraine ought to counter Russian efforts comprehensively, using diplomacy, economic leverage and military-to-military relations to fulfill Ukrainian commercial interests.